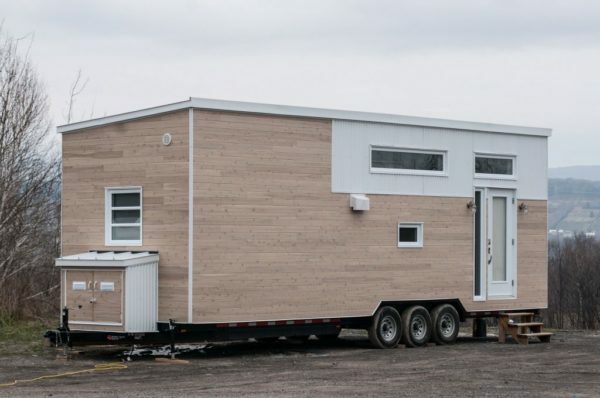 This is the Laurier Tiny House on Wheels by Minimaliste. 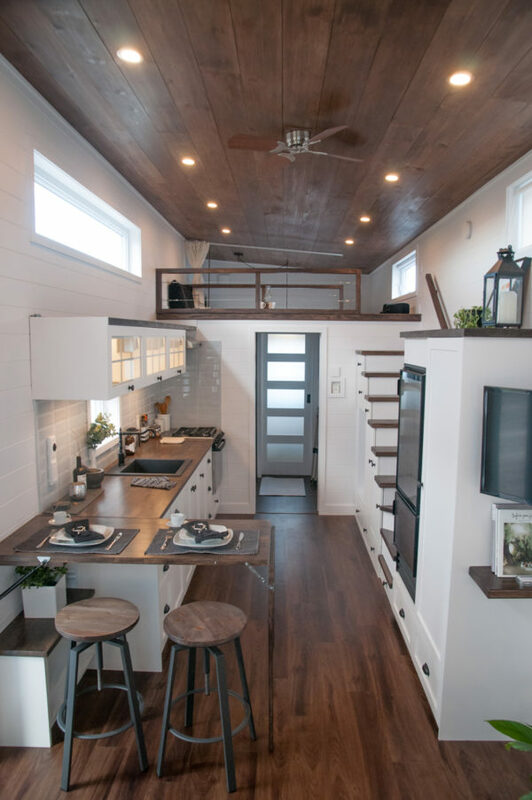 It’s a 365-square-feet tiny home that’s 10-feet wide and 32-feet long. As you may already know, Minimaliste designs and builds modern and very comfortable tiny houses thanks to the extra width they’re willing to build. Normally, a tiny house like this is best if you’re staying put in one place for a long period of time. In other words, if you don’t plan on moving around very often. This is a great tiny house to park somewhere on your own land or maybe in a park model community and just leave it there and enjoy it for a while. And of course, if you ever have to move, you definitely can! A tiny house like this has pretty much all of the amenities you get in a residential-quality home including some extra space. High-quality materials, craftsmanship, and extra space do come at a cost, though, and this unit starts at $128,000 CAD which is approximately $96,605 USD. It’s a lot of money for sure, but after looking at it, I think it’s hard to say it wouldn’t be worth every penny, what do you think? Don’t miss other tiny homes – join our FREE Tiny House Newsletter! The Laurier is our sixth project and it was built for a lady from North Carolina. Ergonomically designed to meet the physical limitations of our client, the Laurier features a master bedroom on the main floor. This energy-efficient tiny-house also brings together several functional innovations, discover them in this page! The base price of the Laurier is $ 128,000, contact us in the quote section to receive the technical sheet and see all our base price included. Our tiny houses on wheels are all unique, our models have been built to meet the specific needs of our customers. Prices vary greatly depending on the options chosen. At Minimaliste, we manufacture high-end products. Our customers can expect to pay between $75,000 and $160,000 CAN for a custom-built, turnkey construction. Pricing in the US vary with the currency ups and down. 2′ wider makes a huge difference. Nidely done; nice finishes. I’d prefer more/bigger windows, I think. And the main floor bedroom is great, though feels a bit claustrophobic to me. Still… I’d buy it, if there was ever a place I could afford to park it forever. Nicely done, hope the client has many happy years in this. Really like the downstairs bedroom which has space at the side to stand and is wide enough for clothes storage. Only difference I would choose would be a door on the toilet compartment else there could easily be an awkward moment if there were visitors staying over night. Very nice indeed. Very nice, looks like a bargain @ $96,000. I like the interior design and it’s fixtures and fittings. White walls with dark wood. Very nice. Decent kitchen and shower room/toilet. And from the pictures on my tablet the build quality and craftsmanship looks good. Not so keen on its overall box like exterior shape though. $96,605! It’s certainly a lot of money! But is $96,605 a lot or too much for this? Being a carpenter, fitted furniture installer and contractor I understand how costs mount up. Factory workshop overheads, skilled labour wages, raw materials, quality fittings and fixtures, profit and taxes all have to be taken into consideration when having something built for you by a business/service supplier. If I wanted something like this, couldn’t do it myself, but could afford afford $96,605 would I pay that much? Probably. But only if I couldn’t do it myself and had a lot more money than $96,605! Basically, Minimaliste is a full custom builder. So it’s like going to a custom furniture maker and having something specifically tailored to your needs and personal tastes/preferences. So everything from the size and shape of the home to the smallest details of the interior design is what they will customize for their clients. They even had a client once that was worried about EMF exposure, so they integrated shielding throughout the structure for her. They are basically building a high end Park series mobile home. Yes, you would need a special permit to tow it (think: wide load). It’s not the best choice if you want to move about frequently, but it’s great if you plan to stay put and only move once in a blue moon. Next post: ESCAPE Tiny House Vacation in Atlanta – Super Bowl Tiny House Anyone?